We always enjoy our convivial visits to Thierry Michon’s biodynamic winery on the Atlantic coast of France south of the city of Nantes. We spend a very enjoyable day tasting the entire range of his wines and bumping around his extensive vineyard plots in his white van. His commitment to biodynamic viticulture is commendable. He often comments that ‘he is alone’ meaning that his vineyards are not next to any other vineyards where there might be sprays used. 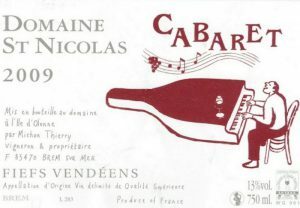 These are great wines from the Fiefs Vendéens appellation – one that is not very well known outside the Loire, however it is the only place in France where Pinot Noir and Gamay are grown in a maritime climate! The vineyards also benefit from the cooling breezes from the nearby ocean and from the excellent soils consisting of clay derived from shale, schist and limestone. The bedrock here is very close to the surface but also very friable, meaning the roots can force their way down through the rocks searching for water. You can listen to an interview given by Thierry during his visit to Australia in 2011. 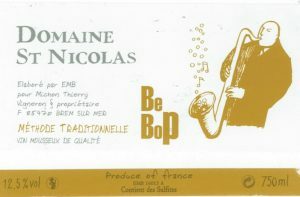 Be Bop is a blend of Chenin Blanc and Grolleau Gris, which will supplement our dwindling supplies of Méthode Traditionnelle sparkling wines (i.e. sparkling wines that undergo a secondary fermentation as is the practice in Champagne). This wine is from the 2011 vintage and had 5 years on lees before disgorging. This is a very fine sparkling wine which has benefitted from the time spent on lees. Les Clous is a south-westerly exposed vineyard which was planted in 1980. It’s been managed biodynamically since 1993. The 2016 vintage is one of the best yet. It is beautiful wine made from a mix of 60% Chenin Blanc and 30% of Chardonnay and 10% Groslot Gris in this vintage. Both the Chardonnay and the Grolleau Gris play a subtle but noticeable role in this beautiful wine that goes so well with food. The vines thrive on a south-east facing slope where the soil is schist-derived clay mixed with quartz pebbles. Bottled in the spring following vintage after elevage in old wooden foudre, it’s light and bright with a strong backbone from the Chenin and is a good wine for pouring by the glass, especially to match seafood dishes. Note that this wine is in very, very limited supply! 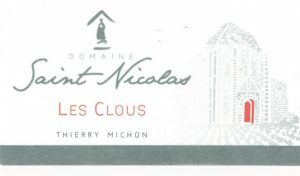 It’s a wine to supplement the very limited quantity of Les Clous, and is fresh, but with length, and ready to be drunk in the next 12 months. This was the first wine we ever tried from Domaine Saint Nicolas and we were hugely impressed with the quality. We didn’t realise that it was Thierry Michon’s entry level wine! It is only Pinot Noir in this vintage. The wine was matured for between 6 months to a year in wooden foudres. It is an elegant wine with good structure. It has not been filtered at our request and we are very happy with the results. This is a smooth and delicious wine that will go very well with a wide range of foods. The Domaine Saint Nicolas Rose is a delicate, pale pink perfumed beauty that is quite savoury with a dry finish making it perfect as an aperitif. The wine is predominantly Pinot Noir although there is some Negrette and Groslot Gris as well to provide some additional complexity. The vineyard faces south-west and the soil is comprised of clay and schist with lots of quartz pebbles. The wine was matured in old barrels for 6 months. This is great value for money at this price. 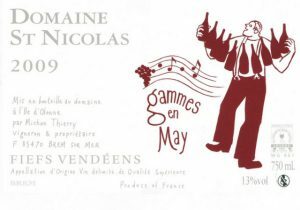 The Domaine Saint Nicolas Gammes en May is a light, refreshing and delicious pure Gamay red wine. It is great for summer drinking served slightly chilled. 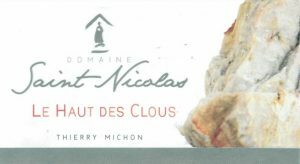 It has less filtering than other Domaine Saint Nicolas wines, which gives it a meaty texture that belies its apparent light juiciness. The vines thrive on a south-east facing slope where the soil is schist-derived clay. The wine was matured for 6 months in wooden foudres. This wine represents excellent value for money at this price. The closure is DIAM. Because this wine is very natural you might find quite a bit of sediment in the bottle – but it doesn’t matter, this wine is really, really fresh and delicious. This is the prestige white from this domaine and is made from 100% Chenin Blanc. It has been fermented with natural yeasts then aged for 18 months in with 80% old oak and up to 20% of the wine exposed to new oak. The grapes benefit from the schist soils that dominate this area and provide the minerality that is so marked in this wine and the cooling breezes from the Atlantic Ocean which you can see from the vineyard which reduce disease pressure. The vines are approximately 25 years old. 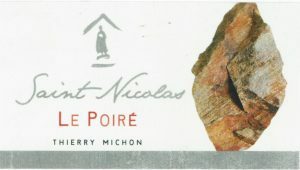 The biodynamic viticulture that Thierry Michon has practised for so long leads to healthier grapes packed with flavour. Note that the beautiful 2016 cuvée of this wine has some residual sugar making it a perfect aperitif wine. This is one of the domaine’s prestige red wine and is made from pure Pinot Noir from vines that are at least 25 years old and that provide very low yields (<30 hectolitres per hectare). The south-west facing vineyard, on schist, has been cultivated biodynamically since 1993. It is already elegant and refined but will continue to improve with age. It is a sensible 13% alcohol. Elevage is in 100% new oak. The Amphora Blanc is made primarily from Chenin Blanc that has been aged in a clay amphora. It comes from the same vineyard as the Haut des Clous which has older vines than the Les Clous vineyard. This is an elegant and interesting wine that holds up very well after the bottle is opened and, in fact, improves as it gets more air. This is a wine that is typical of the Loire region. It is made from pure Cabernet Franc that has been aged in barriques for a year. This is a particularly good example of a Loire Cabernet Franc. It is a great food wine which is drinking very nicely now. It is unusual for a wine of this quality to be available for such a reasonable price. In all the wine tastings that we have carried out in Australia this has been regarded as a beautiful expression of the Cabernet Franc grape. This silky cuvee is named after Thierry’s grandfather and is a blend of Pinot Noir (90%) and Cabernet Franc (10%). It was aged in barriques for 18 months prior to bottling. The Pinot Noir comes from vines between 20 and 30 years old, planted on schist soil. The Cabernet Franc vines are between 15 and 25 years old on clay soil. The vineyards have been cultivated with biodynamic practices since 1995. The grapes are hand-picked and completely destemmed. The maceration was in a wooden tank for 10-12 days with pigeage. The elevage is 18 months in oak barriques. 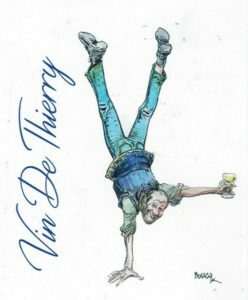 This wine has only recently been released because Thierry likes them to gain some age in the bottle prior to distribution. This is an intriguing wine made from an intriguing grape (100% Negrette). The vineyard from which this wine is made faces south and the soil is schist-derived clay sitting on schist and granite. The wine was matured for 18 months in old barrels. The colour is deep red and the flavour has hints of cherries and plums and a lingering, intense spiciness. One reviewer referred to it as ‘brooding and primary’. It is a great, full-flavoured, intense wine. We think it is like a Pinot Noir on steroids! This one is well worth a try. 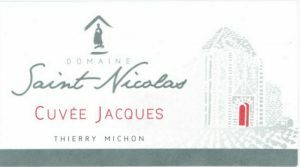 The Domaine Saint Nicolas Soleil de Chine is a sweet 100% Chenin Blanc with 22 grams of residual sugar. The grapes are grown on vines that average in age between 15 and 25 years and that are grown in schist soils. A beautiful wine for dessert or for soft cheese.